This publication offers a reader with comprehensive analysis of professional literature sources on zero-grade theme and analysis of ideas and approaches to the education of Roma pupils from socially disadvantaged environment. 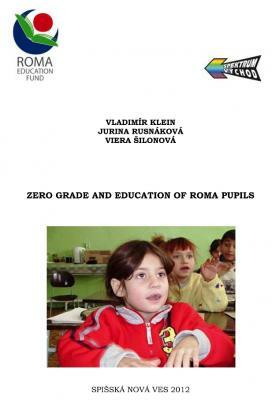 It also provides opinions and views of staff, parents and experts, on the importance and effectiveness of zero grade within elementary schools in regards to the education of Roma pupils. This publication was elaborated within the implementation of the project Roma Education Fund (REF) – Project Code: SLO 042 School for Everybody, in order to examine the effectiveness of zero grade. In contemporary society characterized by globalization processes and accompanied by a number of negative effects, it seems extremely important to seek and find the key strategies and approaches to mitigate their impact. In this context, the importance of education, both in relation to entire population, thus for so called new target groups, is crucial. In the last two decades of responding to the challenge in Slovakia - raising the educational level of the Roma ethnic group - a large number of experienced and committed professionals at the level of theory, research, and at the decisive power and various other helping professions have contributed. Experts dealing with Roma issues agree in opinion, that one of the basic problems of the Roma ethnic group and the common "root cause" of many difficulties in their lives and in society as a whole, is their low level of education (and we agree with them). This fact also suggests that the key role in progressively improving the living standards of the Roma ethnic group will increase their level of education. Education also represents a higher recognition and respect of others within the human society. The objective of our publication is not about exploring the causes of a current state, nor finding the culprit. We provide readers with theoretical and empirical analysis of specific educational (compensation) tool – zero grade in elementary school, which in terms of the Slovak legislation, has been institutionalized for ten years already. Its main objective would be preparing of pupils who didn’t reach sufficient school readiness and come from socially disadvantaged environment, for a successful education in elementary school. We offer a reader with comprehensive analysis of professional literature sources on zero-grade theme and analysis of ideas and approaches to the education of Roma pupils from socially disadvantaged environment. We also provide opinions and views of staff, parents and experts, on the importance and effectiveness of zero grade within elementary schools in regards to the education of Roma pupils. This publication was elaborated within the implementation of the project Roma Education Fund (REF) – Project Code: SLO 042 School for Everybody, in order to examine the effectiveness of zero grade. At this point, we would like to sincerely thank all of our respondents - school staff, parents and experts, whose cooperation was crucial in the process of creating this publication. 5.1	Pupils from socially disadvantaged environment or Roma pupils? doc. PaedDr. Ladislav Horňák, PhD. doc. PhDr. Rastislav Rosinský, PhD.